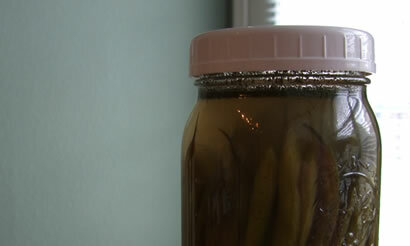 These lacto-fermented “pickled” green beans make a tasty snack or finger-food. Kids, and adults, love them! They are a nutritious snack packed with probiotics for health and enzymes that enhance digestion. Lacto-fermented, or cultured, vegetables and condiments are a great way to get plenty of beneficial “good” bacteria in your gut. Read more about fermented vegetables in our article “Lacto-fermented Vegetables & Fruits…Give Them a Try”. Place half of the sliced garlic to a clean quart-sized mason jar, followed by the red pepper flakes and dill. Snap off the stem-end of green beans. Blanch green beans in boiling water for 2 minutes, then immediately transfer to a bowl of ice water until no longer hot. Drain the blanched beans well and pat dry with paper towels. Add green beans to your jar, stem-end down, packing them close together....it helps to lay the jar on its side at first. Fill the jar completely with the green beans, but do not pack them in too tight. Sprinkle remaining garlic slices on top of beans in jar. Place lid (preferably air-lock lid) on the jar tightly. If using air-lock fill with water according to instructions. Allow to ferment (culture) for 3 days at room temperature, checking after day 2. When they are done, the beans will smell and taste “pickled”, but they should still be slightly crisp. Remove air-lock lid, if using, and replace with storage lid -- transfer to cold storage. How do I know when they are “done”? I plan to store them in my pantry but it won’t be as cool as my refrigerator. If I were to store everything in my refrigerator I would not be able to store food for very long. Maybe I will just have to go back to the regular old hot water bath canning method but I was looking for a better way. I need a stable shelf life for several months because my garden feeds my family all year. Any tips? Tina, Most fermenting recipes do give a window of time for the fermenting. It does not hurt the process to open the jar and using a clean fork try a small bite. If the food tastes still raw let it ferment a day or two more and taste again. Fermenting does require that the end product be kept below 50 degrees. This used to be done by storing the jars in a root cellar, today people use a fridge. Often an older used refrigerator can be found for little money and kept in the garage. Even older units use very little electric since they don’t have to be kept but around 45 degrees. I hope you understand that using the old hot water bath method destroys the enzymes, huts the amount of vitamins and ruins the taste of the vegetables. The whole idea of canned vegetables and fruits that can last just on a shelf is not a healthy concept, these are very lacking foods. I believe they would work fine in the recipe. They do not seem too different than some varieties of beans available here in the US. When I’ve pickled runner beans in the past, they’ve had a tendency to get slimy skins that slip off… that said, it’s always worth a try. I think runner bean flavor is far superior to the regular green bean. I understand the difference between whey and lacto-fermentation; I’m just wondering if blanching them doesn’t kill off the lactobacteria on the beans. Where does it come from? Do you use some brine from some other fermentation? Joe, thanks for writing. Doing a quick blanching on the beans does not kill off all the lactobacteria. It is possible that a few could die off but the majority do not, as evidence in the ferment still taking place – ie., if they all died off in the blanching you would not see any activity during the fermenting time. Every batch of green beans I’ve made this way have turned out delicious! If you wanted you could use some whey or a little brine from another fermentation, but I find it is not necessary. I’m so excited to try this! I’m wondering, what type of lid is best if you don’t have an air lock lid? The white plastic ones or the canning lids with rings? And what lid should I use once I put them in cold storage? I’ve also wondered what constitutes “cold storage”? In the refrigerator, or a basement? Is there a specific temperature range that is considered cold storage? Because in our house, its all pretty much the same temp. It works best when fermenting to have an anaerobic environment (without air). An air-lock system does this. If you use the standard white plastic lid alone it will not be air-tight, this is why we created our system to use a custom natural rubber gasket. If you use just the metal canning lid and band, be aware that those can be lined with BPA that you don’t want in your ferments… yuk! not to mention they have no way to naturally relieve the pressure built up during fermenting and can cause jars to break/crack or even explode! Cold storage for most people today is considered the refrigerator. Ferments need to stay at least 50F, preferably more towards 40F. This will slow the fermenting process and allow your vegetables to last for many months. When in cold storage I like to use just a standard white plastic lid to allow the ferment to “breathe” slightly in the refrigerator. In our Lacto-fermentation Air-lock System we include everything you need – even the storage lids (you just supply your own jars). if there aren’t enough veggies to completely fill the bottle within the 1 inch from the top, do you fill the bottle completely with extra brine, or is it o.k. to just make sure the veggies are covered even though the bottle may only be half full. I will be using a mason jar, and don’t have the air-lock lids. Will putting the mason jar lids serve the purpose? Catherine, I don’t really recommend fermenting in mason jars without an air-lock type system. 1) Without someway to naturally let the gases escape, pressure builds up and can cause a leaky mess all over your counters, or in some cases exploding jars! 2) In all honesty, the ferments done this way just do not “taste” very good. 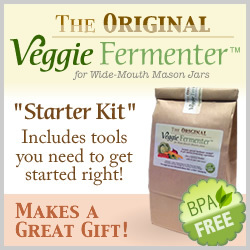 When I first began fermenting years ago I tried the “Mason Jar Method” (with NO air-lock) and I could never eat them because they just did NOT taste good. Now what good is it to take all the time to ferment something if you’re not going to eat and enjoy it? So if you can, I really recommend you invest in some sort of fermenting jar that allows the air/gases to escape during the process. We do have one of the most affordable Air-lock Systems on the market, but there are many other options available out there as well… it is your choice. I’ve been fermenting green beans for years and I never blanch. They always come out great. I usually throw some radishs in for color and a few Thai chilies. Allan, thanks for the comment. Maybe you are using a different type of green bean. Everyone that I’ve tried needed blanching beforehand in-order to ferment properly. Please, what about the beans needed blanching? I’m confused. What happened that you didn’t like? I can’t find your June-August 2011 comments about why green beans need to be blanched before fermenting. Could you give a link to that information please? Why are these called lacto fermented beans since there is no whey or culture added.. Wouldn’t they technically be called “fermented beans” since there is nothing in the recipe to make the “lacto”…… or am I missing something? Brandy, this is a common misconception about lacto-fermentation. The term “lacto” in lacto-fermentation actually refers to the production of lactic acid producing bacteria and NOT a milk/whey/dairy based product. To read more about this you can check out the article Lacto-fermentation: The Methods. I was wondering if I could use culture starter instead of salt since I am on a low sodium diet. Cheryl, if you want to use a starter you certainly may give it a try. You would need to follow the instructions that come with the starter though. If you are looking for a good one, try going to Cultures for Health, they have a good selection. The recipes on this site and also in our book “Lacto-fermenting: The Easy & Healthy Way” really do not have a lot of salt… especially when you break it down per serving. One thing about salt that you may not know is, salt is not bad for you…as long as you are using the right salt. I suggest using a natural salt that contains all its minerals, like Real Salt or Himalayan Salt. I would not use table salt. as it is considered a poison to the body. We have several articles on salt if you want to further your knowledge on the subject. – Do You Need Iodized Salt? – Do I Need Salt? Life or Death? 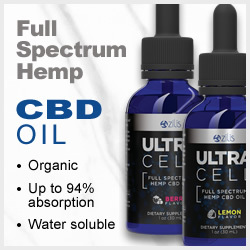 – What Salts Are Best? This recipe is AMAZING! I made some a few weeks ago and just opened the jar. I can’t remember if I followed the recipe to the letter, but if not, I was awfully close. Thank you so much! I don’t even like green beans! At all! But I had some on hand so decided to look for a lacto-ferment recipe, and found your site. I thought I was the only one who lactofermented green beans (we call them Dilly Beans)! I just wanted to say that I’ve never blanched my beans when lactofermenting, but then again, they were processed within hours of picking out of the garden, so maybe that’s why we never had the sliminess issue you spoke of. Our dilly beans have always come out crisp and yummy. I add a grape leaf in each jar to help maintain crispness as well. Thanks for the info Jami! My green beans didn’t do too well in my garden last year so I’ve never gotten to try “fresh-picked” beans. I know we really enjoy the lacto-fermented green beans in my house. Must you blanch the green beans…want to keep the enzymes intact?? Blanching the beans is very important. Like all other legumes, they contain lectins (string beans specifically contain a lectin called PHA). Lectins are known for causing all sorts of issues, such as damage to the intestines etc. Thus the quick “blanching” takes care of this. The whole idea of lacto fermentation is to remove and break down these proteins. Richard, I understand what the paper you’re referring to is stating. Sometimes what is written on paper does not match real life. I’ve tried lacto-fermenting the beans both ways, with blanching and without blanching. The beans done without blanching first did not come out well at all. They were mottled in color, mushy, slimy, and really inedible. The beans done with a quick blanching first came out well everytime. There was no discoloration, the taste was great, and the beans stayed fairly crisp. I’m not seeing any whey in this recipe and wonder if that is an oversight, or if it doesn’t need any. I’m thinking it would for it to be “lacto fermented”. Please respond as I am hoping to do these tonight and it will be my first try. I’d like to do it right! Thanks!! Whey is not always needed for lacto-fermentation. The term “lacto-fermentation” refers to the creation of lactic-acid by friendly bacteria in the fermentation process. See the following article on The Methods of Lacto-fermentation for greater detail on the lacto-fermentation process.